English National Opera are set to bring the Broadway musical Man of La Mancha to the London Coliseum, starring Kelsey Grammer and opera singer Danielle De Niese. The musical, written by Mitch Leigh, Joe Darion and Dale Wasserman, is inspired by Miguel de Cervantes’ 17th century novel Don Quixote. It sees Cervantes recite the story of Don Quixote to a group of fellow prisoners awaiting a hearing from the Spanish Inquisition. It features songs like “The Impossible Dream”, which has become a standard in the American songbook. For more information on the London production, CLICK HERE. Mr. Carlos Cavalcanti’s spectacular production of MAN OF LA MANCHA Sau Paulo, Brazil, after an initial run Sept–Dec, 2014, has been extended by popular demand for an additional six months and it will be presented in Rio de Janeiro next. Over 65,000 people attended in 2104 and a projected 220,000 people will see the production in 2015. Martha Nelly Wasserman attended the production on Dec. 21, 2014, which happened to be the sixth anniversary of her beloved Dale's passing, and witnessed how the audience was thrilled, laughing and crying with joy! “They even brought special pink and blue 12-inch flares which they lit up to show their love and respect for Cleo Baccic (Quixote), the gorgeous leading man, when he sang THE IMPOSSIBLE DREAM with such passion. It was MAGICAL!” she said. “Mr. Carlos Cavalcanti's fresh, new and creative production is different than usual, but WHAT A HIT!” she explained. The Sau Paulo production has won the following awards: the APCA AWARD 2014 for best theatrical play; the FOLHA DE S. PAULO CRITICS AWARD for best musical 2014; the APLAUSO BRASIL AWARD 2014 for best musical; and the APCA AWARD 2014 for best actor, Cleto Baccic. During this anniversary year, many major countries have already signed up to do a first-class production, starting January 14, 2015 in Buenos Aires, Argentina (where the reviews are all favorable, and it is doing exceptionally well). Martha Nelly has been invited to make an honored visit in early March and is scheduled to attend for one week. During the last week of March she plans to attend a production in Washington, DC. Currently, MAN OF LA MANCHA is planing in Mexico City; Santiago, Chile; Caracas, Venezuela; Bogota, Columbia; Vienna, Austria; Germany; Russia; Poland; Madrid, Spain; Hungary; Romania; Czech Republic; Beijing, China; and Switzerland. Martha Nelly will be traveling to Venice, Italy in April 2015 for the Italian opening of ONE FLEW OVER THE CUCKOO'S NEST, which is now playing outside of Naples in a authentic insane asylem. It will move to Venice, then to Rome and Milan with professional actors in early November 2015. BURNING IN THE NIGHT is playing in Arizona at the Mesa Arts Center and Theater Works in Peoria during the month of February, 2015. 2014: Tom Rooney Is the Man of La Mancha Beginning May 8, 2014 at Stratford Festival. Directed by Robert McQueen, Man of La Mancha continues performances through Oct. 11, 2014 at Stratford's Avon Theatre. Written by Dale Wasserman, with music by Mitch Leigh and lyrics by Joe Darion, the original production of Man of La Mancha was staged by Albert Marre and produced by Albert W. Selden and Hal James.Cervantes is played by Tom Rooney, with Robin Hutton as Aldonza and Steve Ross as Sancho Panza. The cast also includes Matt Alfano as Tenorio, Brigand; Matt Armet as Anselmo; Shane Carty as Governor/Innkeeper; Stephen Cota as Paco, Brigand, Inquisitor Priest; Paul Duncan as Guard; Harry Edison as Guard; Sean Alexander Hauk as Padre; Kayla James as Antonia, Brigand; Galen Johnson as Jose, Brigand; Monique Lund as Housekeeper, Brigand; Ayrin Mackie as Fermina, Brigand Dancer; Marcus Nance as Captain of the Inquisition, Brigand; Cory O'Brien as Pedro, Attendant to the Enchanter; Stephen Patterson as Barber; Kevin Ramessar as Romero; Kimberley Rampersad as Maria; Jason Sermonia as Juan, Brigand, Attendant to the Enchanter; and Shawn Wright as Duke/Dr. Carrasco/Enchanter. Chad McFadden is the swing and Bonnie Jordan is the understudy. "Man of La Mancha follows the saga of Miguel de Cervantes, playwright, poet and tax collector, who finds himself imprisoned and awaiting trial by the Inquisition," press notes state. "When his fellow prisoners try to confiscate his few possessions, including the uncompleted manuscript of his most famous work, the novel 'Don Quixote,' Cervantes defends his masterpiece by presenting it as a play. Transforming himself into the title character, and recruiting his fiercely loyal manservant along with other inmates to take on various roles, he plays out his sweeping story of a deluded would-be-knight who becomes obsessed by his idealistic belief that the wrongs of the world can be corrected. ""While much of Cervantes' military history is well documented — as a younger man he had been a soldier, injured during battle, captured and enslaved for five years — his full biography is largely a mystery," McQueen said in a statement. "It was Dale Wasserman's dream to delve into that mystery to create a play, an act of the imagination, that drew from Cervantes' theatrical and literary life. Cast from amongst the cut-throats in whose company he currently finds himself, the stories the poet performs are improvised versions of the Don Quixote adventures found within his book. Through the enactment of these adventures, both author and character plumb to the core of life's fundamental questions: Why am I here? What purpose does my life serve? How do I engage significantly in this relatively short time I am given? "The creative team includes choreographer Marc Kimelman, musical director Franklin Brasz, set designer Douglas Paraschuk, costume designer Dana Osborne, lighting designer Kimberly Purtell, sound designer Peter McBoyle, video and projection designer Sean Nieuwenhuis and fight director John Stead. 2014: MAN OF LA MANCHA will be presented in 36 U.S. Cities between January 4 and March 30, 2014 including five shows in Phoenix, Arizona at the Orpheum Theater January 17-19. To download a pdf of the full tour schedule, CLICK HERE. Theater Works proudly presents the world premiere of a play based on the memoirs of Dale Wasserman, the renowned author of Man of La Mancha and the play One Flew Over the Cuckoo's Nest. Dale rode the rails as an interant laborer — a hobo, not a bum — as a teenager during the Great Depression. Acclaimed Arizona playwright Richard Warren has turned Dale's memory of those crazy-free wanderings into a funny and moving evening of theatre, seasoned with some of the great American folk songs of the rails and the road. Be a part of the launching of a lovely new play — right here in the shadow of the "Atchison, Topeka and the Santa Fe." 2013: ONE FLEW OVER THE CUCKOO'S NEST - Coming in mid-August, 2013. This first class production will be performed in Buenos Aires, Argentina (in Spanish) with major movie/TV stars from Latin America performing the leading roles. 2013: PREMIERE (Dale's intellectual and informative comedy) is scheduled to play April 12 - May 5, 2013 in Olympia, Washington at the Olympia Little Theatre. MAN OF LA MANCHA played in the Deauville France Festival, August 10-11, 2012, concert style performed by David Serero. 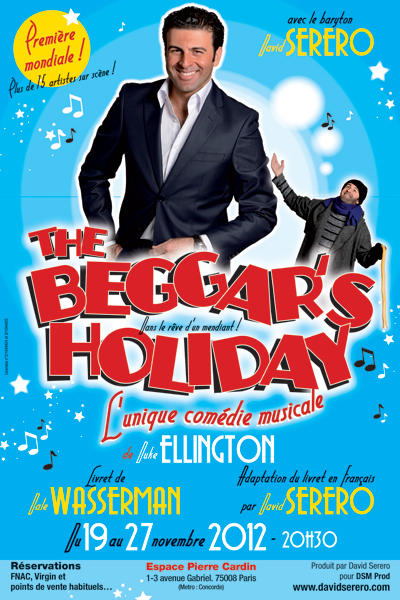 FIRST CLASS PRODUCTION of Mr. Dale Wasserman's BEGGAR'S HOLIDAY in Paris, France on November 19, 2012 at the exclusive PIERRE CARDIN THEATRE. Produced and performed by David Serero in the lead role! (Including singing and tap dancing!) Music by Duke Ellington and lyrics by John Latouche. The December 18th, 19th and 20th, 2009 SHOWCASE presentation of BEGGAR'S HOLIDAY at the Master Craftsman's Guild Theater in Pittsburgh was exceptionally well received by audiences, who just loved it. Standing ovations were unstoppable for all three performances. This exciting and most entertaining old/new musical was written by Dale Wasserman, based on the Three-Penny Opera with music by internationally famous Duke Ellington; lyrics by John LaTouche. 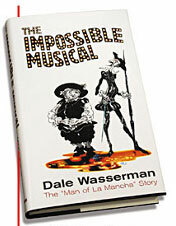 As previously stated, it is the only musical that Dale was able to convince Duke to write for Broadway many years ago. An unprecedented December snowstorm kept numerous prestigious members of New York theater from attending; nevertheless, it did not prevent the show from being noticed by a number of top producers from New York, Moscow and Paris. Much appreciation to Artistic Director Jonathan Eaton of the Opera Theater of Pittsburgh for having the courage to present this very timely, Americanized musical satire. Many thanks as well to Mike Tamaro, Musical Director of Jazz Studies at Duquesne University of Pittsburgh, who added the exquisite sound of Ellington, giving it its magic -- his musical arrangements for BEGGAR'S HOLIDAY were truly unforgettable.